Till Next Year Halloween! – Have a fun day! This is the 2nd year that I made a Halloween costume for my son instead of buying it. 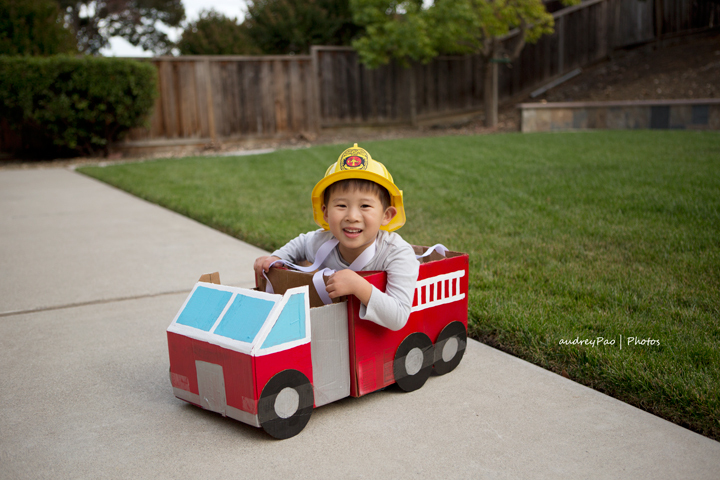 Plus it was hard to find a fire truck costume. Although toward the last weekend before Halloween, I started to doubt if i could finish and was looking for a back up costume. Thank goodness the hubby was on board about it and agreed to watch the kids so I could work on it. OK to be fair, he did contribute, he painted the tires black and tied the front of the truck to the back of the truck. This was totally stressful but I also felt a ton of satisfaction when I saw my boy wearing it to trick to treat. After building the prototype, I proceeded to cutting up boxes and assembling it. I resized the height of the boxes first and then the width of the box. To keep the integrity of the corners, I measured from the corners and cut out a flap in the center. To reinforce the cut area, the flap was taped back on on the inside. 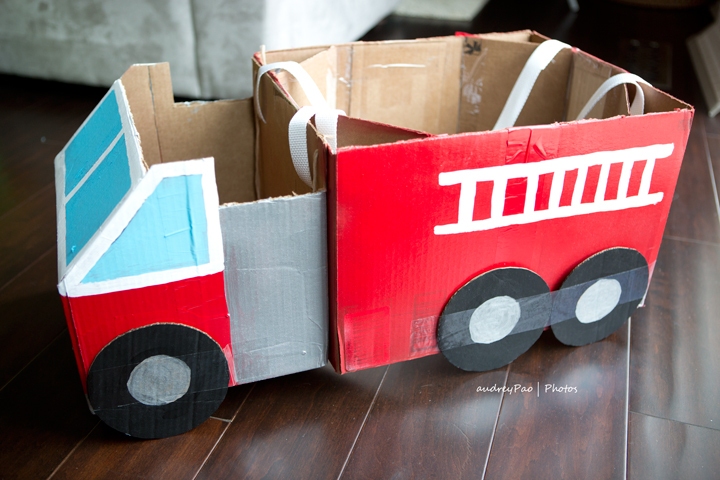 I decided to keep the bottom of the box that was used to make the front of the firetruck so it can be a treat bag/container. 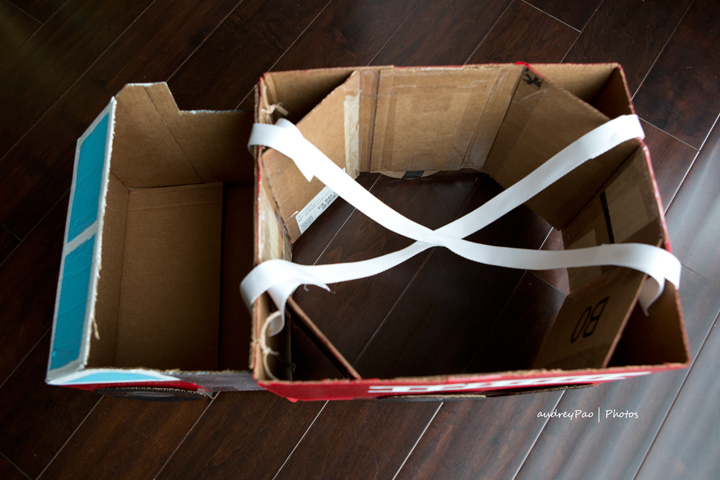 The other flaps from the top of the box were used to stabilize the box so it doesn’t collapse and fold together. After that it was just painting it. 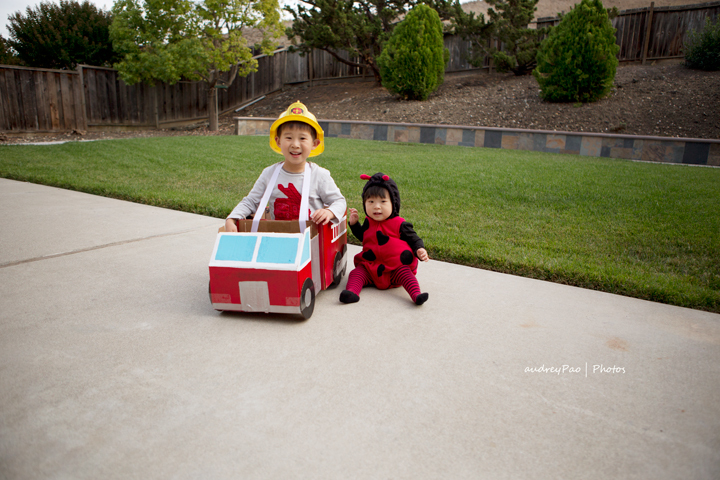 I spent all my time on this that I had no time for a custom costume for the 2nd kid. So next year, I should start early, like in August. Here he is trying on the costume the day before. And here they are, my precious babies. < A Firetruck? Why not a firefighter?!! Pingback: I Survived Halloween! | Have a fun day!